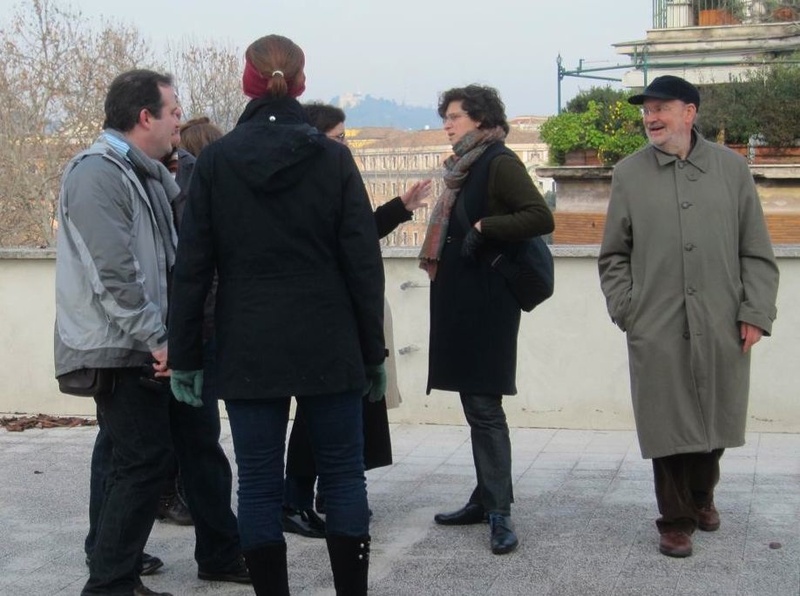 Since late December, and through early April, Leonard Barkan is the American Academy in Rome Scholar in Residence in History of Art. He is one of the most distinguished scholars in the field of comparative literature, and his numerous writings have earned wide praise for their lucid analysis of pressing issues in literature, art history, and the interstices of these two disciplines, especially for the Renaissance. Barkan is Class of 1943 University Professor in the Department of Comparative Literature at Princeton University, with membership also in Princeton’s English and Art and Archeology Departments. He previously taught at Michigan, Northwestern and NYU. 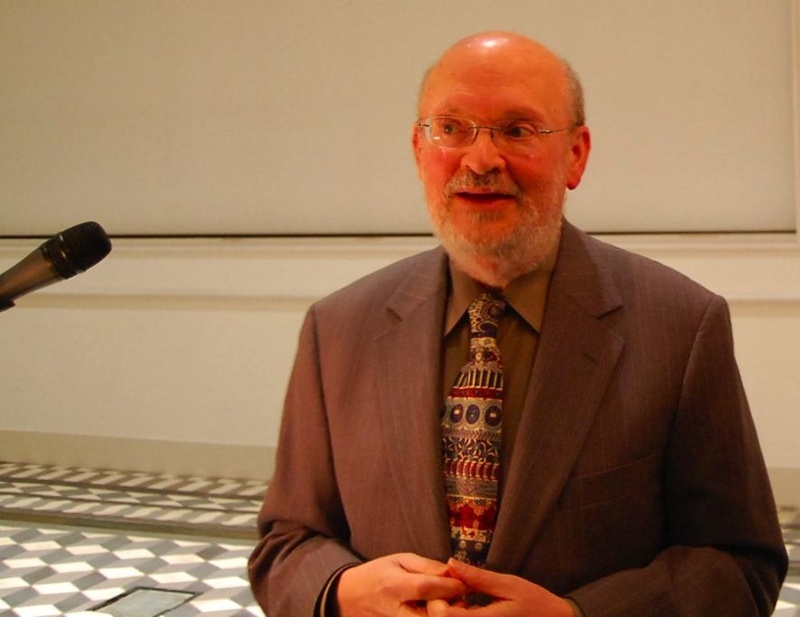 Leonard Barkan’s many prizes include election to membership in a number of learned societies, most recently a fellowship at the American Academy in Berlin. Barkan is the author of more than a half-dozen books, including Satyr Square: A Year, a Life in Rome (Farrar, Strauss & Giroux, 2006), a memoir and meditation on his intellectual and personal relationship with Rome, with photography by his partner Nick Barberio (who also is working this winter/spring at the AAR). This coming November Princeton University Press will publish Leonard Barkan’s latest work, Michelangelo: A Life on Paper. 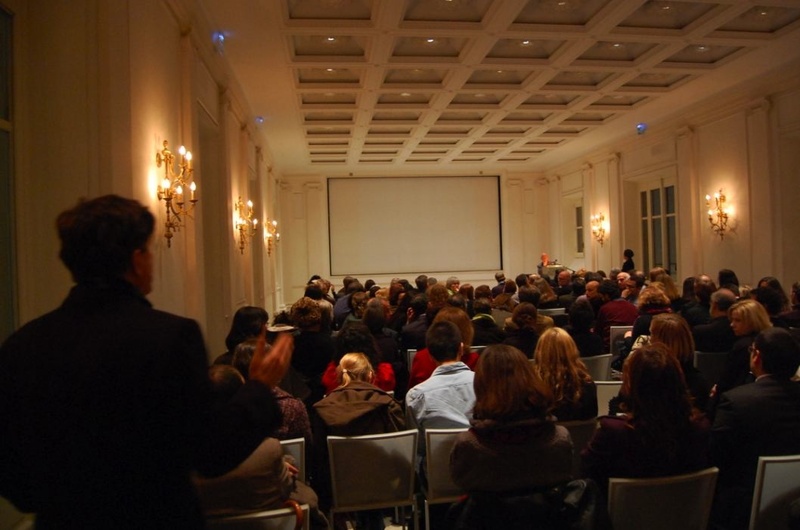 On 11 February Barkan delivered a far-ranging lecture at the Academy’s Villa Aurelia, entitled “Thinking of the Grapes: Food Culture and High Culture in Early Modern Europe”. There was a capacity crowd of more than 140, including some 30 members of the Friends of the Academy in Italy, who highlighted this event (and the dinner that followed) on its busy 2009/10 calendar. In a way, Barkan’s presentation was a preview of the topic of the Jerome Lecture which he will deliver next March at the Academy in Rome and also in Ann Arbor at the University of Michigan. 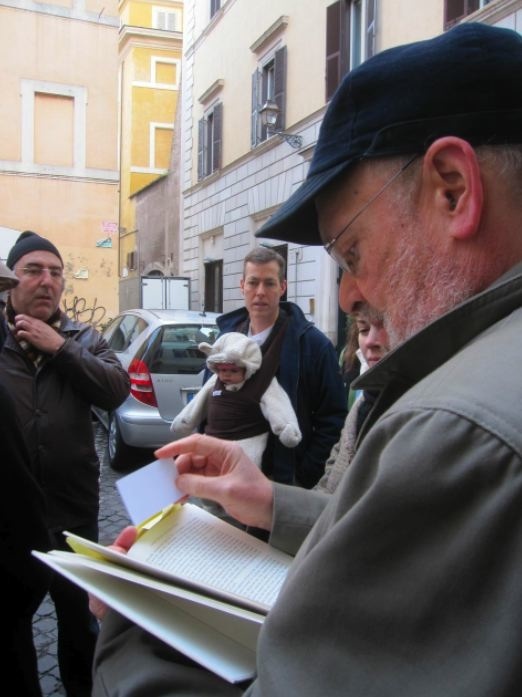 The AAR Weblog caught up with Leonard Barkan soon after his lecture and asked him a couple of quick questions about his work in the Eternal City. Tell us a bit about your connections to Rome. I know you’ve had quite a lot before joining the AAR this year as a Resident. I have always been intrigued by the notion of “overdetermination”—roughly, referring to an effect that has many causes, any one of which would have been sufficient by itself to explain it. My connections to Rome are, precisely, overdetermined. I wrote a book about rediscovering ancient sculpture in Rome during the Renaissance; I entered an extraordinary circle of friends in the city once I started doing research here in the 1980s; for fifteen years I have been writing about food and wine for a publication that is produced here; I published a memoir about a year of my life here; my partner is a photographer with a special interest in capturing unexpected mixtures of old-and-new on the urban scene. 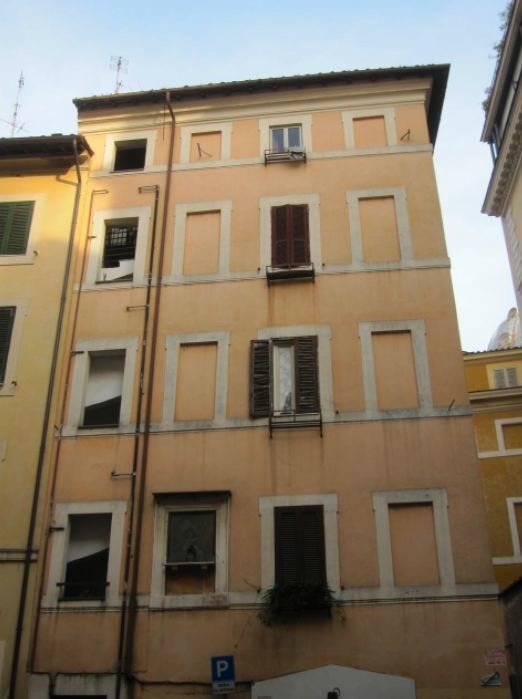 About the only thing I haven’t previously done in Rome is to be part of the American Academy, a lack that has now been joyously remedied. And so how have you been spending your time here so far? During these few months of my residency, I am poised between two very different projects. Michelangelo: A Life on Paper, which will be published this November, still keeps me busy with coaxing some of its 208 color photographs out of their various Italian sources. The new work, still untitled, will involve another scholarly departure for me. Having considered for years the relations between the arts of the word and the arts of the picture, I am now asking about connections across a still wider gap, between what is called “high culture”—poems, paintings, symphonies—and the world of eating and drinking. Focussing (as usual) on antiquity and the Renaissance, I am noticing just how deeply interwoven these activities are, both conceptually and in practice. All of which will, I hope, emerge when I return to the American Academy in 2011 to deliver the Jerome Lectures. The fact that I am researching a project in gastronomy just when the Academy is blessed by an extraordinary culture of good food and wine: that, too, is blessedly overdetermined. This entry was posted on February 16, 2010 at 10:42 pm and is filed under Uncategorized. You can follow any responses to this entry through the RSS 2.0 feed. You can leave a response, or trackback from your own site.